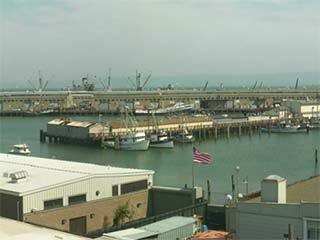 We will show you over 20 webcams in San Francisco area. San Francisco, known as the "City by the Bay," is a worldly and seductive place, full of culture, magnificent sights and outstanding food. Its famous sights include the Golden Gate Bridge, cable cars, Victorian Row houses and its steep rolling hills. Surrounded by the Pacific Ocean and the San Francisco Bay, the city is subject to thick fog that rolls-in, often in the summer and fall. Streaming Flash Earhtcam from San Francisco Bay's South End Rowing Club with a pre-roll advertising. 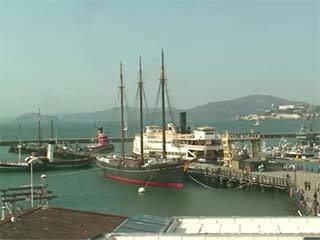 Slowly streaming cam from Sam's Anchor Cafe located in Marin County. A panoramic view of San Francisco. Choose from a variety of landmarks, or pan across the panorama. 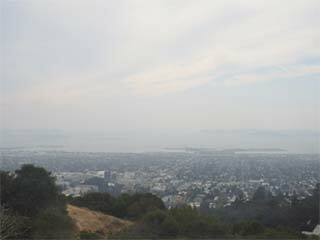 Enjoy the view from the Lawrence Hall of Science, overlooking the San Francisco Bay Area. 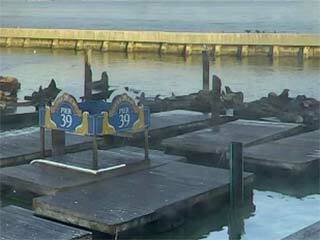 A panning streaming webcam of Pier 39 Marina with its Sea Lions. 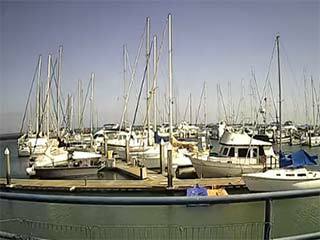 Two still cams from Sausalito Yacht Club. Still cam updated every few seconds from the Wierd Piet, an environmental field station. 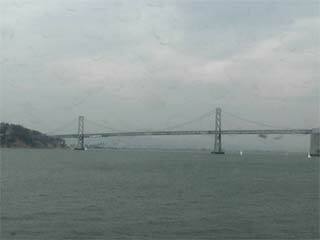 Still cam of the Bay Bridge from ABC channel 7. 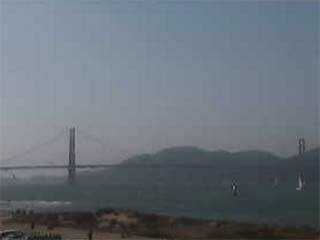 Small streaming pan, tilt and zoom cam of the Golden Gate Bridge. Muir Beach in Marin. Still updated from time to time. 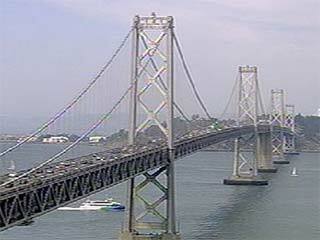 From CBS San Francisco, over 30 traffic cams. Still images updated every five minutes. Pacific Ocean in Mendocino. A new picture is taken every 10 minutes. Still image of Shelter Cove along the scenic Mendocino coast. Updates every minute. Point Arena Lighthouse, Mendocino County. Still image updates every 30 seconds. Live streaming Flash surf cam from Surfline with pre-roll advertising. Live streaming surf cam from Surfline with pre-roll advertising. Another must is taking a ride on the famous cable cars. They were designed to carry passengers up the steep hills of San Francisco. There is even a cable car museum on Mason Street that has models and photographs of the early cable transit system, including the first cable car from 1873. Between the cable cars, trolley buses, ferries and just walking, you can see a lot of the city without even having to drive your car. If you do decide to drive, be sure to be careful before parking on the street. A much safer bet is to park your car in a parking garage or lot. San Francisco is known for its "hills," which in San Fran is 100 feet in height or more. There are 42 hills within the city. Some of the most notable hills are Nob Hill, Pacific Heights, Russian Hill and Telegraph Hill. Coit Tower is located atop Telegraph Hill and is a landmark dedication to the San Francisco firefighters. From the top of this hill you can also get unparalleled panoramic views of the city. Also try and explore the Greenwich and Filbert steps, which is a brick staircase that leads down from there through a flowering hillside of gardens. An interesting day trip is to the remote Alcatraz Island out in the Bay. This former maximum security prison, know as "The Rock," once held Al Capone. 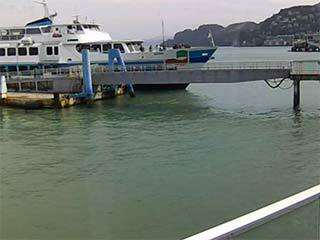 You can take the Blue & Gold ferry from Pier 41 at Fisherman's Wharf. There is even a guided tour in which you can see the inside of actual cell blocks. Advance reservations are recommended. Alcatraz Island is now part of the Golden Gate National Recreation Area. Also located in this recreation area is the Presidio, where the city's fort originated. The Presidio finally closed as an Army post in 1994. Now there are miles of public hiking trails and bike paths. 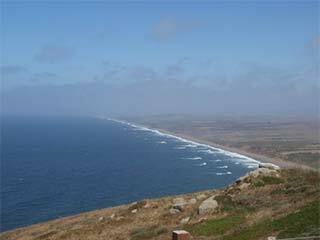 On its hills you can get a spectacular view of the surrounding ocean and bay. Down by the waterfront is the famous Fisherman's Wharf. Here you will find many interesting attractions such as the Wax Museum, Ripley's Believe It or Not Museum, and the Boudin Sourdough Museum and Tour where you can learn about the art of baking the original San Francisco sourdough bread and even get a taste. The Wharf contains many restaurants, markets, souvenir shops and tasty treats to buy, such as clam chowder in sourdough bowls. Next to the Wharf is The Embarcadero, an interesting waterfront area facing the eastern shoreline of the bay, and lined with different piers. Here you will find Pier 39, a 2-story shopping complex full of shops and restaurants and The Aquarium of the Bay. There are also interesting street performers and live stage entertainment. Be sure and see the sea lions that live on the docks. Close by is Pier 41 where you can catch the ferry to Alcatraz. Within walking distance of the Wharf is the Cannery and Ghirardelli Square. Originally a chocolate factory, Ghirardelli Square has become home to many specialty shops, bakeries and restaurants. However, you call still by some of that delicious Ghirardelli Chocolate there. If you do decide to take out the car, be sure a take a drive down Lombard Street, between Hyde St and Leavenworth St in the Russian Hill neighborhood. Known as "the crookedest street in the world," this one-block long portion of the street follows a series of several S-curves, while descending at a 40-degree slope. Be sure that your brakes are working! You will also be amazed at the gorgeous, well-landscaped Art Deco-style homes that line this curvy street. If you don't have a car, you can take the stairs. While in the San Francisco you may want to take in a performing art. You can choose from the San Francisco Opera, San Francisco Ballet and the San Francisco Symphony, all are world-class venues. The city's two major performing halls are the Louise M. Davies Symphony Hall and the War Memorial Opera House; both are just west of the Civic Center. In addition, there are several theaters that have major touring plays and Broadway productions. For sports fans, you may want to take in a game. The San Francisco area is home to the SF 49ers and the Oakland Raiders NFL teams. During Baseball season you can see a SF Giants game or an Oakland A's game. And for basketball fans, you can watch The Bay Area's Golden State Warriors. Another interesting daytime activity is touring the area's Victorian Houses, known as "painted ladies." There are three main architectural types of Victorian Style homes: Italianate, Queen Anne and Stick Style. These homes were built between 1870 and 1906. They were built very close together with very little outdoor space. The Queen Anne-style Victorian houses were built around the late 1800's and were embellished with intricately ornamented towers, turrets and cupolas, and painted in vibrant colors. Many of these beautiful homes are in the Pacific Heights, Cow Hollow and Haight-Ashbury districts, as well as in Alamo Square. The Hass-Lilienthal House in Pacific Heights, a Queen Anne Victorian built in 1886, currently has docent tours on Weds, Sat and Sun. There is even a walking tour of these Victorian homes that departs from the Westin St. Francis Hotel. A trip to San Francisco would not be complete without a visit to the Chinatown area on Grant Street. Here you will find fantastic Chinese restaurants, markets and shops. Be prepared to see a myriad of exotic foods, smells and colors all crammed into a narrow avenue and a series of back alleys. A real treat is to have some authentic dim sum on Sunday in one of the really good Chinese restaurants. Within walking distance from Chinatown is the North Beach area, San Francisco's Little Italy. Located near Vallejo and Grant St, here you will find many outdoor cafes, bakeries and authentic Italian restaurants. It's a great place to have lunch. Another great spot to visit is Union Square, at the corner of Gary and Powell streets. You can even take the Powell-Hyde cable car to get there. The square was built in 1850 and its focal point is a 97-foot statue of Commodore George Dewey commemorating his Manila Bay victory over the Spanish in 1898. Union Square is the center of downtown life. There are restaurants, cafes and luxury hotels, such as the Westin St. Francis. Inside the lobby of this famous hotel is a well-known ornate grandfather clock. In the square are also some of the finest shops and retail stores such as Saks, Tiffany and Neiman-Marcus. Close by to Union Square is Nob Hill. Here you will also find some of the city's finest hotels, such as the historic Mark Hopkins. With its stunning bay and city views, Nob Hill is also home to some of the city's most expensive real estate. It was formerly home to the tycoons that made their fortunes in railroading and gold mining. Another point of interest is the Golden Gate Park. This 1017-acre park is a lush oasis featuring artificial lakes, miles of bridle paths and hiking trails. Within the park is a restored windmill, an equestrian center, golf course, boat rentals and a carousel. While you are at the park don't miss the Conservatory of Flowers and the Japanese Tea Garden. Should you have more time, a visit to the city's museums is a treat. Some of the most popular ones are the SF Museum of Modern Art, the beautiful California Palace of the Legion of Honor in Lincoln Park, the Asian Art Museum and the Exploratorium inside the Palace of Fine Arts. In addition, visit the Mission San Francisco de Asis, one of the oldest buildings in the city, founded in 1776. It has one of the most ornate alters of all of the Missions. There is also a Moorish-style basilica next door. Be sure to save some energy (and money) and treat yourself to a gourmet meal in one of the many upscale restaurants. Many of the best dining rooms and cocktails bars sit atop the city's luxury hotels. At the top of the Bank of America Building is the Carnelian Room restaurant and bar, with incredible city views. After dark the city comes alive with bars, clubs and lounges scattered about in the South of Market, Marina and North Beach areas. While you are out be sure and take a look up at the Transamerica Pyramid Building at 600 Montgomery St. This famous skyscraper is San Francisco's tallest building, with 48-stories, 6000 windows and a 212-foot-tall spire on top. It can be seem from all around the city. Tour the Victorian houses known as the "pink ladies"
Drive down Lombard St., the "crookedest street"